In order to bid via our website in our Public Auctions an active account is nesessary. If you already have an account please visit our website and log in by filling your username at the field (1) and your password at the field (2). Then press button “Log in” (3). If you don’t have an account, you have to register first by pressing “Register now” (4). Below you can see our registration form that you have to fill in. 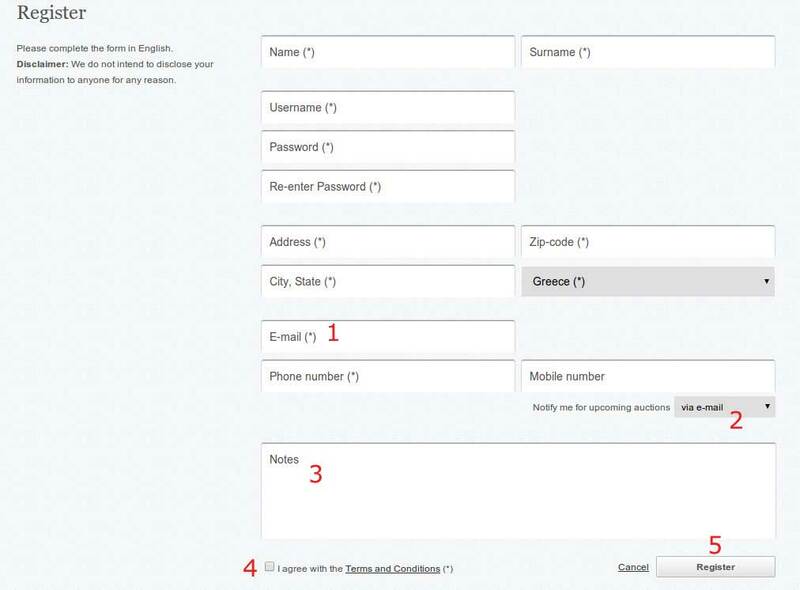 Please fill in all the fields (Name, Surname, Username - Password - choose easy to remember username and password, Address, Zip-code, City, State, Country, E-mail, Phone number). Please fill in your primary email (1) in order to get all our notifications! You can choose, if you like, to get notifications for upcoming auctions (2), you can write down any special notes (3), agree with our Terms and Conditions (4) and finally register by pressing the “Register” button (5). In order to place a bid, fill in your offer at the field (1) and then press “Place Bid” button (2). By choosing to finalize your bids you will be redirected to the screen below. Here you can view all your current pending bids. You can edit your bid (1) or even remove it (2). 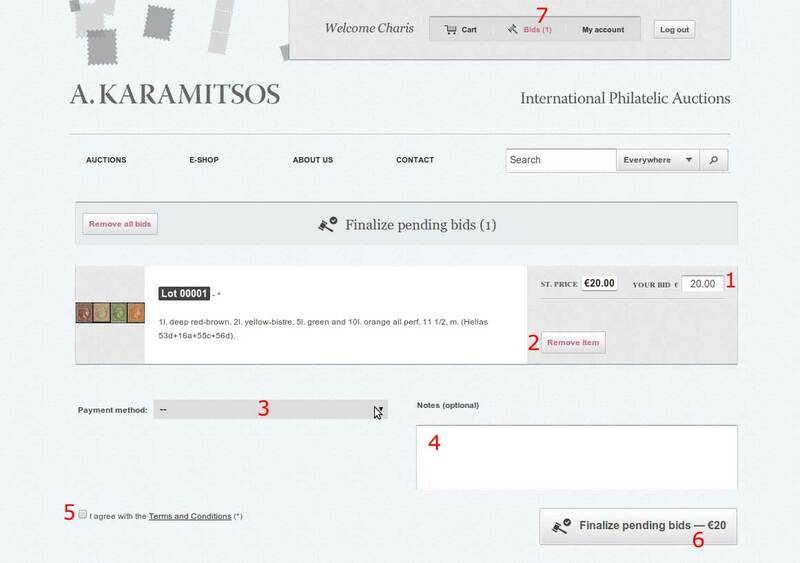 In order to finalize your bids you have to choose a “Payment method” (3), write down any special notes for your bids (4) - optional, agree with our Terms and Conditions (5) and finaly press the “Finalize pending bids” button (6). You can come back to this screen any time and from any page of our website by pressing the red “Bids” button (7) on top of the page.